It’s a difficult moment. A unit inspection reveals a growing clutter problem. A tenant complains about a next-door neighbour that paces all night long. 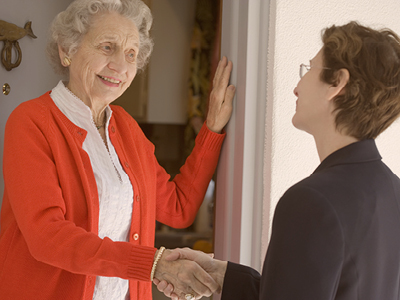 You see an elderly tenant beginning to decline. Non-profit housing providers are often the first people to spot a vulnerable tenant who may need help. To prevent a problem from turning into a crisis, they need to call on community support agencies. But how can you ensure you’re connecting tenants to the right support while maintaining and respecting their privacy? You find Mrs. Lee, aged 88 years, wandering the hallway in her nightgown. She seems confused, but is content to accompany you back to her apartment. A week later, the next door neighbour says Mrs. Lee had opened her door, mistaking her apartment for her own. When she moved in, Mrs. Lee named her daughter as an emergency contact. You have not been in touch with the daughter previously. Would you call Mrs. Lee’s daughter? This is not an emergency – no harm has come to Mrs. Lee, her neighbours or the building, and there is no imminent danger. On the other hand, it is an opportunity to start an important conversation, and to invite Mrs. Lee’s daughter into that discussion. As you think about how to proceed, weigh the risks of calling the daughter (Mrs. Lee might feel embarrassed or betrayed), with the risks of not calling (Mrs. Lee might place herself in real danger if she wandered out of the building). After you leave, document what you said and what Mrs. Lee agreed to in terms of next steps. If Mrs. Lee puts herself at risk of danger through her wandering, you might invite her daughter to visit Mrs. Lee with you to discuss the situation and plan what to do next. Some non-profit housing providers see privacy laws as an obstacle to connecting their tenants to support services. But they don’t need to be. Upholding the rights and dignity of vulnerable tenants and can help prevent problems from escalating. Looking for more guidance on how to approach these tricky situations in a balanced way? 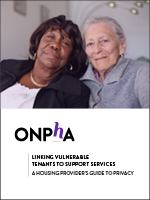 ONPHA’s Privacy Guide is a free resource available exclusively to ONPHA Housing Members. The guide walks you through concrete examples like the one above, and provides the information you need to know about privacy laws, best practices and the housing provider’s role. Access this resource: ONPHA Housing Members can access the Privacy Guide and appendices here on our website. Please note that you must be logged into our website as a Housing Member to download the guide.